People tend to see me as an extrovert. Actually as someone who is overly extroverted. But actually I tend to be very much of an introvert. Apparently when I started kindergarten I spend a few days observing everything before jumping into the action myself. There were some days on which everyone was playing outside and I was busy with a friend of mine weaving carpets for my dolls or working on a drawing. That introvert in my has always been there, more or less present. But over the years and through various circumstances the extrovert society wanted me to be took over. I guess it’s a strategy of survival. Recently I came across this article Hey, parents – leave those introverts alone! by Tim Lott published in The Guardian. It made me think. Think some more. Brought back some memories and underlined the obvious. I must be quite an introvert, even though I can be severely extroverted. I recall at University spending days without socialising (besides classes, and short chats in the library). I used to spend hours in my room reading, drawing, listening to music or I’d stay late in the library (my second home, or was it the first?). I didn’t see many friends at those moments. I don’t think that it was uncommon for me to sort of disappear from view for a few days. I guess many people, who know me won’t believe me if I say that I am an introvert. So over the last months starting with my shingles in May I have been plunged into a massive introvert session (if I can call it that). My body rand the alarm bells… I needed to cope with the loss of my mother and for that I needed some alone time, I needed to retract to my little shell. On the blogging side I let go of well everything for a while. Hopefully I will be back a bit more regularly, because blogging is such a great activity! I do partially blame the A to Z Challenge, I felt oblige to follow the rules, to visit, comment and comment back. Just one day I could not cope with it all. Now I have to take a new approach to the whole commenting and replying to comments, one that does not deprive me of my energy. During the summer I focussed on work, June and July were good months, August was quiet, but the truth be told I could not have worked much anyways. I also wanted to make sure that little one could go outside every day, play and enjoy the sun. My habitual blogging slot, which was on most day’s little one’s nap time disappeared, not only has little one taken to not napping on several days of the week, when she does I tend to join her. Oh there was another thing that has thrown me off the rails mostly in August and during the first half of September, but more to that later on. Today is the first day quite some time that I have found a moment to sit down an write. Well that’s not entirely true, as I have several posts sitting in the draft folder and bits and pieces of stories jotted down in a notebook (sitting on Omaha Beach in the sandy wind and trying to write can be quite a challenge). For anyone wondering, we have some beautiful tomatoes growing on the windowsill, the only trouble is they aren’t as tasty as I would have hoped. And I managed to fulfil one of my New Year’s resolutions! 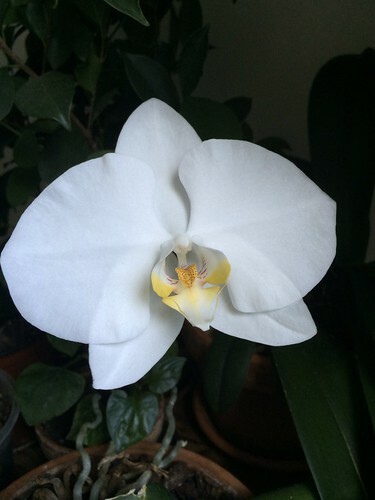 One of our Orchids has been blooming for quite a while now. Hi Solveig! It’s great to see you again! Right now I am slowing down my blogging pretty much for the same reasons – it has becoming too much and if I post, I need to read and comment and there just aren’t enough hours in the day! I’m sorry you had shingles. And surprised since you are so young. I know they can be awful. I’m hoping you are a lot better now. I am very, very much an introvert. Sometimes I try to act like an extrovert, but it doesn’t work well. There is a great book, “Quiet”, about introverts. I may write a post about it some day. As for you, if you are introvert, you do need your alone time, your introvert time. Funny, one part of blogging is that for me – even though I am communicating with people, it’s all in my head, not out loud with twenty other people trying to talk over me. Nice to read you again, Solveig. I totally feel what you mean. Do not worry about blogging a lot or a little. When I started I wrote without allowing any comments. It felt a little hard on the people who might read and give me feedback. But it is true that it is time consuming to keep up with a blog, especially if you have a full time job or want to write fiction, for example. So I’m taking it slow these days. I don’t post on a regular basis, only when I have something to share. And sadly it also means spending less time reading other blogs and commenting. I will perhaps announce a temporary break soon as I am in deep revision for my latest novel. So, again, I get what you mean and I hope you’ll follow what your life tells you to do. No rules need to be followed. Take care. Peace. And enjoy your baby and your tomatoes. I always feel like the biggest difference between an introvert and an extrovert is the energy flow. An extrovert gets recharged by all the people and interactions. As an introvert I can pretend to be extroverted, but it drains me. I need my quiet time to get back to myself. Welcome back! I’m so sorry to hear about the loss of your mother. There are no words. And, fellow introvert here who totally gets disappearing for a while. Yes, you are a socialised introvert. So am I. You can tell because we spend long periods on our own – and really need them if in hectic contact with other people for any length of time. Hope things are looking up; getting over shingles is harder than you think it should be, and losing your mother is just as hard as you think. Sending hugs. Whether you attribute it to cards or stars or the universe, we get put in these spots. Know what I’ve noticed? It’s times like these, when it doesn’t feel like we’re blogging, that we’re still blogging – through thoughts and notes, drafts and notions. Even when you’re not publishing, the mind of a blogger keeps blogging on.